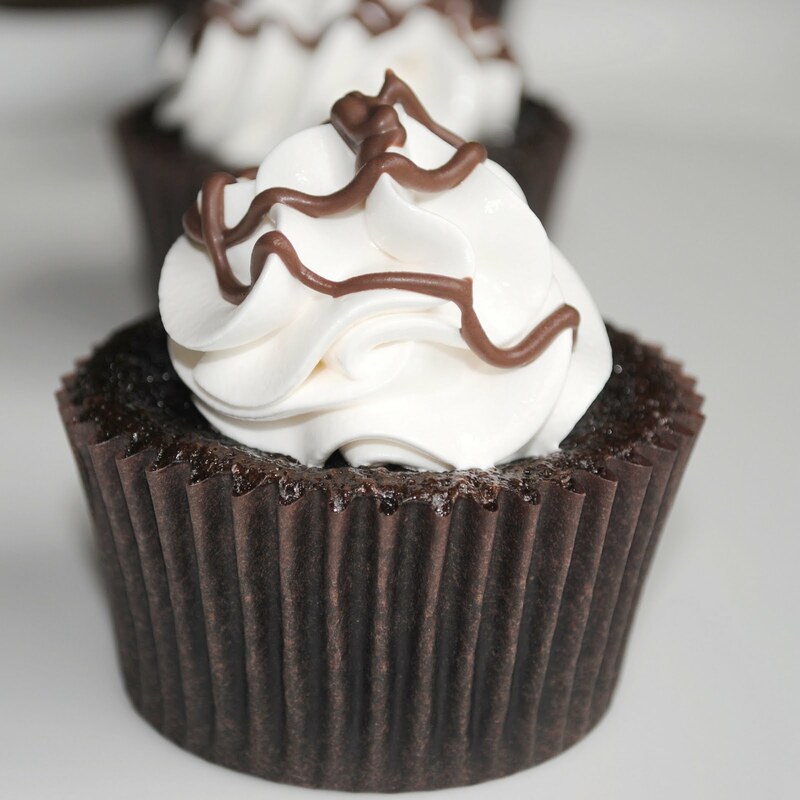 These chocolate marshmallow cupcakes are adapted from the S'mores cupcakes I made a while back - which just so happen to be the most popular recipe I've ever posted. These don't have the graham cracker base and don't require a kitchen torch or incredible timing with the broiler. They do however require a lot of egg whites to make the frosting, so I recommend a nice custard style ice cream to go along with them. With a few less steps involved, these are an easier version. I love this marshmallow frosting. It does take a little more time than a traditional American buttercream but its so light and glossy. I've used it on several things lately - stay tuned for some more recipes coming up shortly. 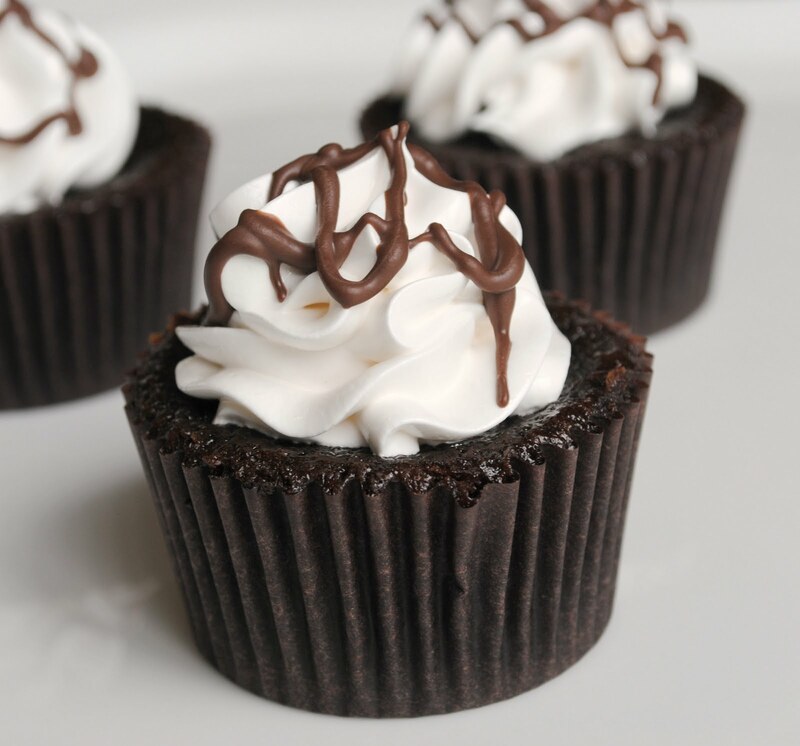 Drizzle a chocolate ganache over the top to add a little something extra. Set a clean stainless steel or other heat proof bowl over a pan of simmering water to create a double boiler. (I just use my KitchenAid bowl for my stand mixer to avoid having to transfer.) Add all ingredients except vanilla and whisk to combine. Heat, whisking almost constantly, making sure to scrape the sides of the bowl frequently until the mixture reaches 160 degrees. Transfer to mixer/mixing bowl fitted with the whisk attachment and continue mixing, increasing speed slowly to high speed until the frosting holds stiff peaks. Add vanilla extract and beat until just incorporated. Fill a piping bag fitted with desired tip (I used a large closed star tip for these) and pipe as desired onto cooled cupcakes. Note: You don't want to make this frosting until you are ready to use it as it will harden so wait until your cupcakes are cooled. Heat heavy cream until simmering in a small saucepan (you can also microwave but do it in 30 second intervals and watch it closely). Cut chocolate into chunks and put in a small bowl. Pour cream over chocolate and let sit for one minute. Stir until chocolate is melted. Let stand about 5 minutes and transfer to a squeeze bottle. Drizzle over the top of cupcakes. Yum, those look tasty! The cake almost looks brownie like. Is it a heavy cake like that or is light and fluffy? Either way, they look go enough to me! @Amanda - Thanks! They are very brownie like, it's a really moist cake that is pretty dense. Do you ever have trouble with the frosting going grainy? Every time I have made Seven-Minute frosting, it is perfect after I first make it, but after it sits for a few hours it gets very grainy. Just wondering if I'm the only person in the world with this problem. I love the frosting, but hate to use it because it's rare that I make a cake and have it served and eaten entirely in a few hours. @allison - I haven't had this problem - I do make sure to use this frosting right away but have definitely let the cupcakes sit for several hours/overnight before serving them and haven't had any issues. What bag or tip or skill are you using to get the frosting looking so swirly and perfect, please? 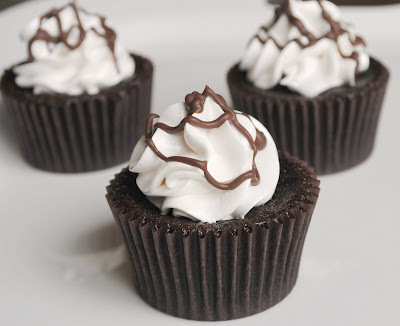 I'm not usually a cupcake fan, but I've been drooling over these pictures for hours now. These are so totally cute and cool! Really...how do you get the frosting to look like that?! Thanks! Thank you - These are done with a Wilton 2D closed star tip - the 1M will work as well but you get more of the swirly layers look with the closed star tip. What do you mean when you say "Combine sugar through salt in a large boil"? Oops sorry - that should be combine in a large BOWL! The last question was about combining sugar through salt???? What does that mean? Combine everything from sugar to salt in the ingredients list. About how many "average" sized cupcakes does this make? Did anyone else have problems with the frosting being runny? If your frosting was runny - I'm guessing you didn't cook the egg whites to the correct temperature, didn't mix long enough, or there was some form of oil/grease in your mixing bowl. A meringue-type recipe won't set up if there is any oil/grease on the mixers/bowl as it interferes with the egg whites stiffening up. Chocolate and marshmallow, two my favorite things. Awesome cupcakes,I've featured this recipe on my blog, hoping that you don't mind, but if you do, please contact me and I'll remove it. All the best. Thanks for sharing -- glad you liked them!